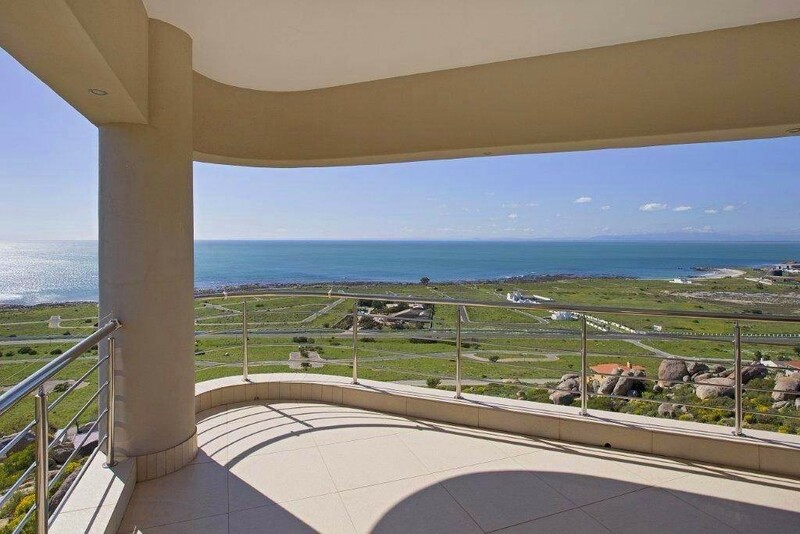 Sign up and receive Property Email Alerts of Houses for sale in Blueberry Hill, St Helena Bay. A stunning residence on Blueberry Hill with 4 en-suite bedrooms and a flatlet and uninterrupted sweeping views of the emerald waters of St Helena Bay. The home boasts interior spaces with high quality finishes throughout and arranged in a flowing plan of graciously scaled rooms, highlighting the multiple living and entertaining areas. *Garage for four vehicles Battery standby system charged by Eskom for necessary lights in case of power failures (Switch over). * Main bedroom with 1 X King-size bed, en-suite bathroom, dressing table, build-in cupboards, TV, gas fireplace, and balcony facing the ocean. * Second bedroom with 1 x King-size bed, en-suite bathroom, dressing table, build-in cupboards, TV and balcony facing the ocean. * Third bedroom with 1 x King-size bed, en-suite bathroom, dressing table, build-in cupboards, TV and balcony facing the ocean. * Forth bedroom with 3 x single beds, en-suite bathroom, dressing table, build-in cupboards, TV and balcony facing the mountain. * FLAT: 1X room with King-size bed, build-in cupboards, en-suite bathroom, open plan small kitchen, fridge, gas stove, lounge suite, TV and balcony facing the ocean. * BAR Under counter bar fridge and Ice machine with lockable cabinet. * TV LOUNGE 9 seated leather lounge suite, Big screen TV in lockable cabinet, gas fireplace (Balcony with 180 Ocean view) and Jacuzzi. * In and outside back-to-back braai. * Scullery with dishwasher, washing machine and tumble dryer. * Garden tap with basin, washing lines. * 1 x Lockable cage with 2 gas bottle. * 2 x 250liter Solar Geysers. * 1 x 5000liter water tank rainwater with pump connected to bar basin. * DRAIN Septic tank Pump system. * Fully fenced sides and front with lockable gates. Sign-up and receive Property Email Alerts of Houses for sale in Blueberry Hill, St Helena Bay.